Taken at the bird feeder, between the trailhead, and the parking lot in Pikes Peak State Park, Iowa. Camera was the Canon D30 digital SLR, with a 70-210mm zoom, and a 35-85mm zoom. I highly recommend this whole area, as a great vacation spot. 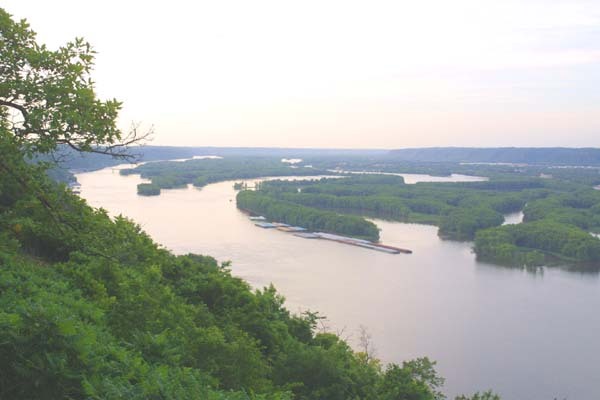 Pikes Peak State Park in Iowa is located on the Mississippi River, directly across from the equally appealing Wyalusing State Park in Wisconsin. This is the upper river, an area of bluffs, and ever changing islets, and sand bars. The nearby small town of Marquette, Iowa, and McCormick Iowa are set into the river bluffs, looking like little mountain towns. Across the river is the Wisconsin town of PrarieDuChien, the biggest town in the immediate area. Dubuque, Iowa is perhaps 20 miles south of here, along the wondrous River Road. 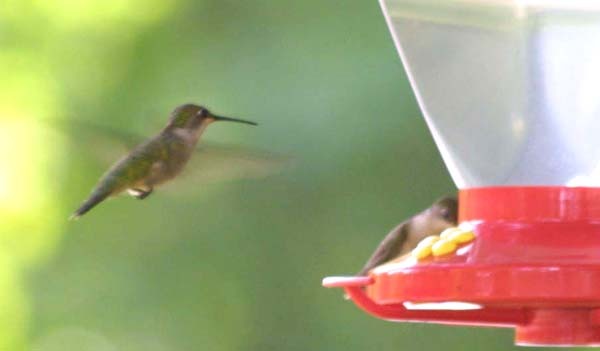 The hummingbirds are only one of the myriad small wonders (perhaps the smallest) of the area. The river is, by contrast, larger than life, carrying huge barges, and tons of silt down to the delta at the Gulf of Mexico. 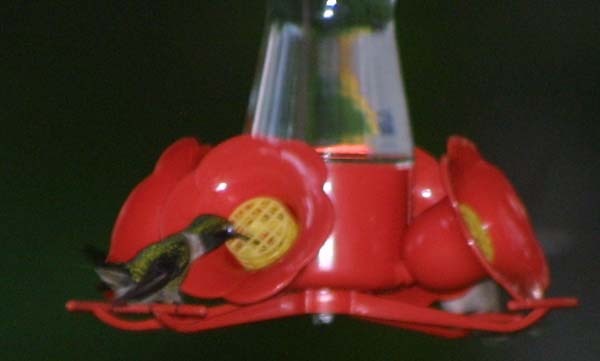 Hummingbirds gather at three bird feeders under a huge pine tree. They flit about like the bees with which many people confuse them. They are incredibly fast, and will shoot up into the tree, or out across the parking lot. The birds are pretty distinctively marked, with the wing feathers being a somewhat darker shade than those of the body. 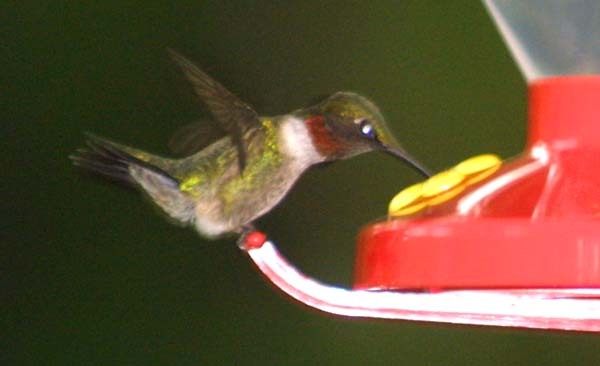 At one time, before a specimen was obtained, many people believed that hummingbird wings did not have feathers at all, but were filmy like those of a dragonfly. These birds are not silent, but their call is not a hum. There was a constant din of chirps, and squawks, as the birds chased each other, went up into the trees and flew around. 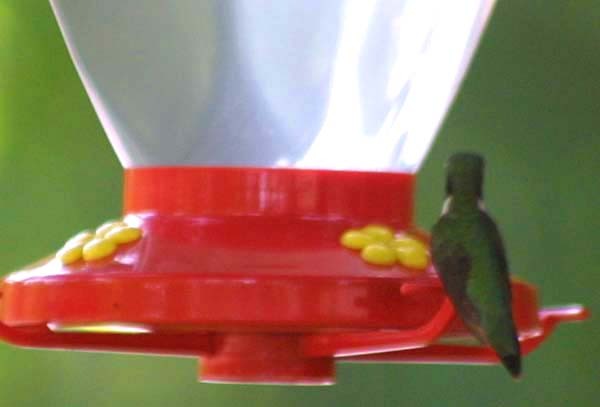 A lone hummer has the feeder all to herself, for a change. 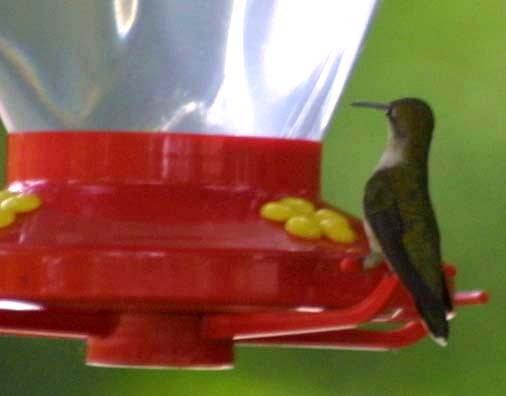 This appears to be a female ruby throat. The wings are just a blur in most of these photos. They beat 80 times a second. The tiny hearts beat 20 times a second. 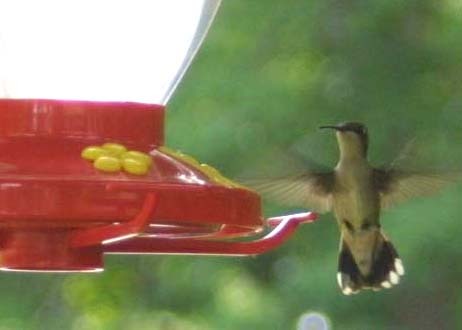 The small, fast moving wings generate a constant hum, from which the birds get their name. The sound reminds me of a cats purr. 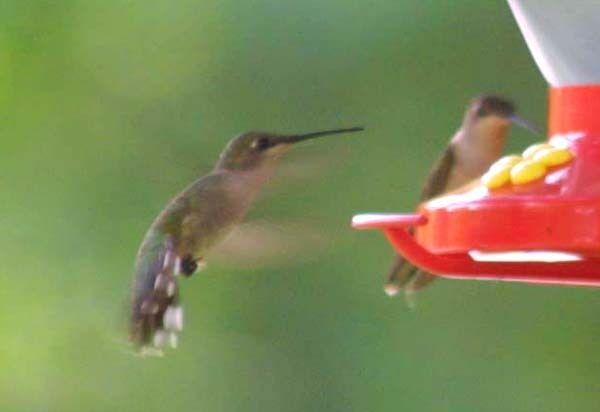 Pair of ruby throats slow down to come in for a landing. Feet out to grasp a perch, this bird fans it's tail, flaring for a landing. In this, and the rest of the photos, I have stopped down and used the flash in an attempt to slow the birds motion a bit. This also has the effect of reflecting off of the iridescent feathers and making them seem to glow. 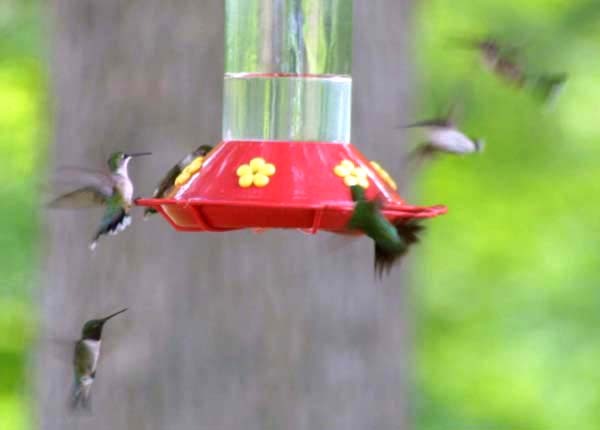 These birds are tiny, being about two or three inches long. Depending on your monitor, and the resolution you set, this photo may be larger than life size. 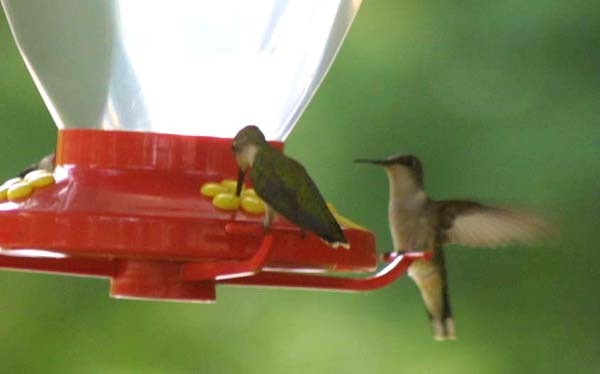 A pair of birds at the feeder. They did not like my flash, and generally flew off right after a snapped a picture. 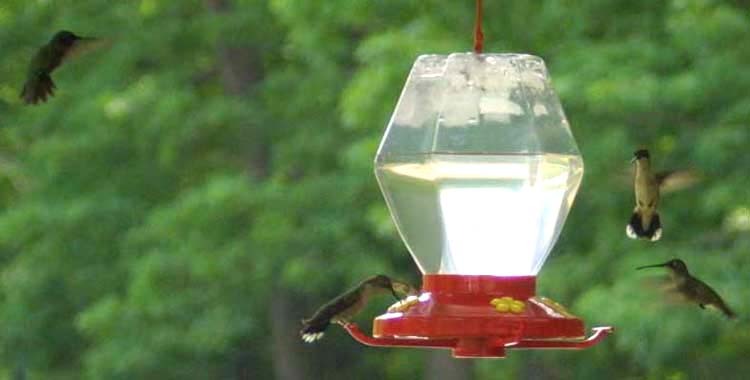 A male ruby throated hummingbird. 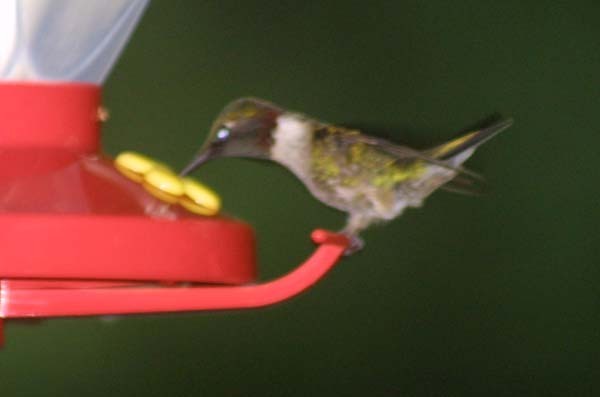 A female ruby throated hummingbird. No hummingbirds in this view. It is a look down the Mississippi from one of the viewing platforms on the bluffs. This is the main attraction at Pike's Peak State Park. 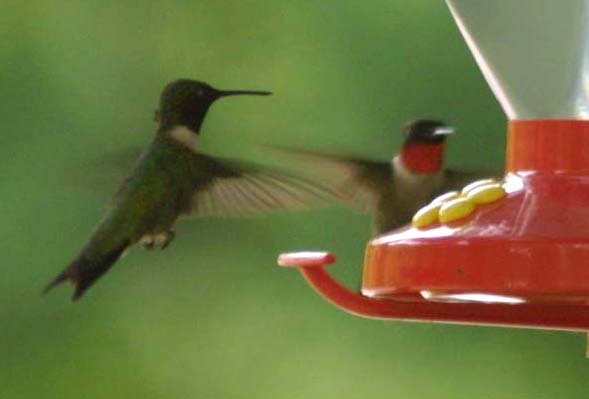 The hummingbirds are just a sort of additional feature.